On April 2nd my boyfriend and I were adjusted by you for the first time. Prior to our visit that day, I had been driving Duke’s car for a few days and I kept smelling something like rubbing alcohol in the car. I told Duke about it knowing full well he would never be able to smell it because he lost his sense of smell years ago. He drove his car all day on April 2nd and met me at your office that evening. We were both adjusted and as we were pulling out of the parking lot Duke stopped his car, got out and fiddled with something in the back seat. I was following him so I stopped, yelled out the window and asked him what the heck he was doing. 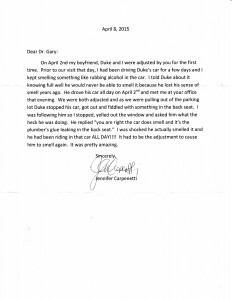 He replied “you are right the car does smell and it’s the plumber’s glue leaking in the back seat.” I was shocked he actually smelled it and he had been riding in that car ALL DAY!!!! It had to be the adjustment to cause him to smell again. It was pretty amazing.